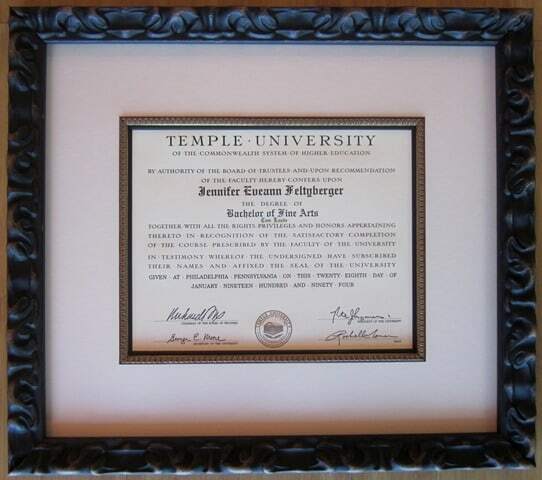 As many of us do when we graduate from college, I didn’t think too much about how my diploma was framed. 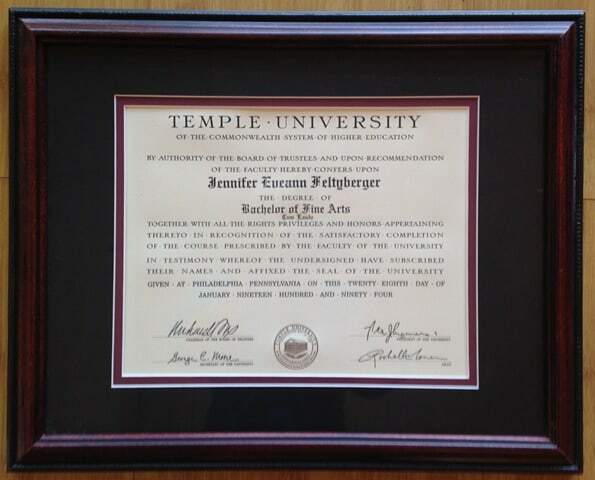 I was a starving artist with big student loan payments, and went the ready-made frame way to display my diploma (see below). This small piece of paper that I spent over $25,000 on, got jammed into a cheap frame and matt. I went to art school! My diploma should look a bit better than that! Come on! I work at THE FRAME STUDIO! I am a picture framer! So I decided to reframe this expensive piece of paper – 22 years later. The first thing we had to contend with, was the damage that was done to my diploma because I used ready made products. The frame had regular glass – no UV protection – and the matts and backing board were acidic. This caused 2 things to happen: the regular glass allowed the UV rays to change the exposed part of my diploma to a pinkish-orange hue (as seen in picture below); the acidic boards burned the back of my diploma and turned it yellow. 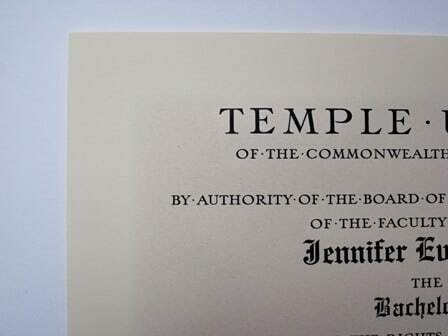 We had to work with the UV damage on the front of the diploma, so the matt opening had to come up to the edge of the burn. We tried to keep the design as neutral as possible, while still adding some artistic elements to show that art school taught me something. Utilizing the wavy gold fillet to pull out the gold seal, and then picking the black ribbon-like frame to reiterate the wave gave the appropriate amount of flair to a rather boring (but expensive) piece of paper. Now I have something to show for art school . . . go custom framing!! !